The Vascular Function Curve describes how systemic venous return to the right atrium varies with Right Atrial Pressure (RAP). Normal venous return is largely determined by the blood pressure gradient between the right atrium and the venous blood. When the RAP rises, the gradient is reduced and thus venous return slows. The atrial pressure at which venous return becomes zero is known as the "Mean Systemic Pressure" and corresponds to what the blood pressure would be throughout the circulation if the heart stopped pumping completely (i.e. the individual died). As the RAP declines, venous return increases because the blood pressure gradient between venous blood and atrial blood increases. 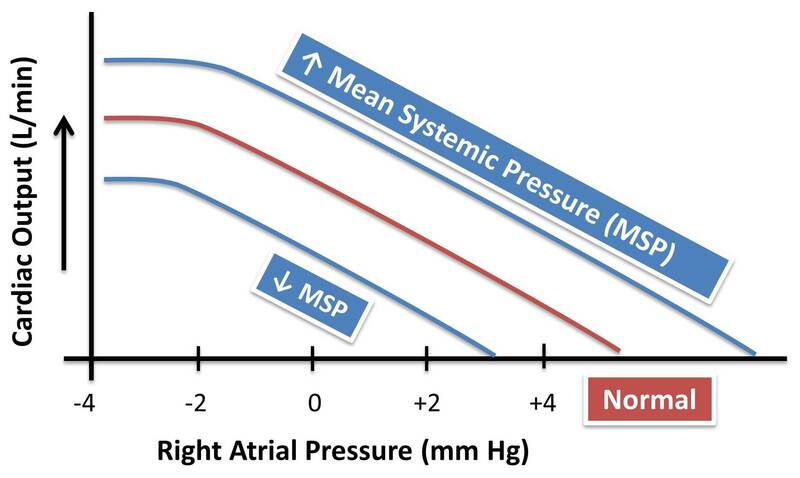 However, venous return plateaus at negative atrial pressures because at pressures less that atmospheric pressure (i.e. <0 mm Hg) large thoracic veins begin to collapse, thus preventing further enhancement of venous return to the heart. As described above, venous return becomes zero at the pressure equivalent to the "Mean Systemic Pressure" or the theoretical pressure of the blood throughout the circulatory system if the heart stopped beating. This is intuitively comprehensible since at venous returns of zero a person would be dead anyway given that the heart would no longer have any blood to pump. It turns out that factors which change the "Mean Systemic Pressure" shift the venous return curve to the left or right. The physiologic reasons why the entire curve is shifted rather than just its x-intercept are likely complex and not fully understood. However, empirical studies have shown that the entire venous return curve shifts to the left or right by factors which would affect the theoretical "Mean Systemic Pressure". The two factors which have the most impact on the Mean Systemic Pressure are the total blood volume and the vascular compliance of the veins. If we were to imagine a dead individual with no heart beat, it is clear that pumping external blood into their circulatory system, thus increasing their total blood volume, would increase the pressure of blood within the dead individual's entire circulation. Consequently, changes in the total blood volume proportionally change the Mean Systemic Pressure and thus the venous return for any given RAP. As described in venous physiology, the veins possess a large volume of the total body's blood at low pressure. When veins are stimulated by the SNS, the vascular compliance of these veins decreases and venoconstriction occurs, reducing the total volume of blood within the veins, sometimes termed the "Unstressed Volume". Given a constant volume of blood, reductions in the venous volume will significantly reduce the total available volume of the circulatory system, thus increasing the Mean Systemic Pressure, assuming that the heart is not beating. Consequently, changes in venous compliance due to modulation of SNS activity change the Mean Systemic Pressure and thus the venous return for any given RAP. In addition to the affects of Mean Systemic Pressure, Arthur C. Guyton has proposed that a physiological value termed the "Venous Resistance" can affect the slope of the vascular function curve. Some texts have simplified "Venous Resistance" to correspond to Systemic Vascular Resistance; however, as we understand it this was not the intention of Guyton. At the current moment there is some controversy as to the physical basis of this "Venous Resistance" value and its significance in terms of venous return. Consequently, we have left out a detailed discussion of this topic.